Here’s the full set. I wavered on the cover color for a while before deciding that simple black would let the silver text shine nicely. Usually I like to match the color to the book somehow. My Fraction/Aja Hawkeye set is purple, Fantastic Four is blue; that sort of thing. I typically only list the writer of a series on the spine since that’s how I alphabetize the books on the shelves, so I stuck with only putting “Roberts” on the spines. I don’t mean to diminish the artistic contributions of Milne, Burcham, Lawrence, and others. I promise it’s just for organization’s sake! 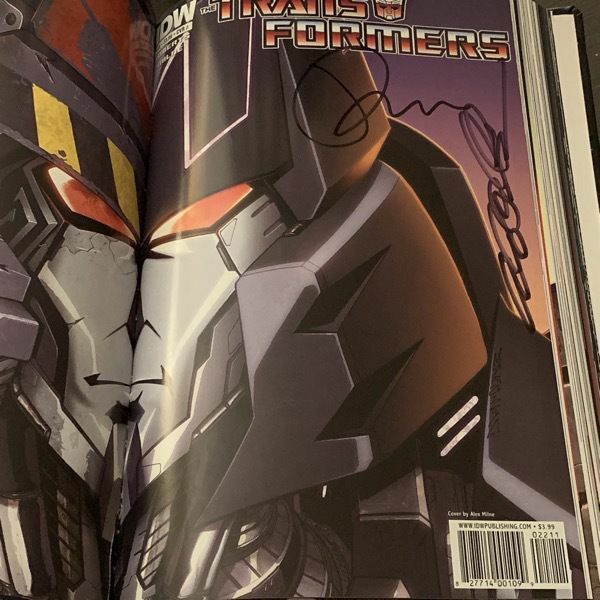 Roberts and Milne were kind enough to sign a few issues I had when I met them in Virginia last year. 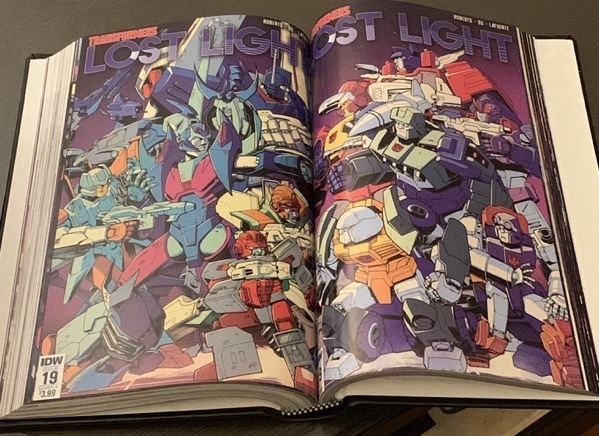 Transformers: Last Stand of the Wreckers, along with several issues of More Than Meets the Eye had short prose stories that I was able to include. I abhor variant covers, but I couldn’t resist putting together the four connecting covers for the first issue. Another exception to my variant cover dislike. These two have the characters facing each other and look nice contra each other. Something you don’t get in published trade paperbacks are the “previously” pages. You don’t need them in a collection, of course, because the issue it’s recapping is just right there in front of you, not separated by a month’s time, but Roberts and crew do something clever and incorporate the “previously” page into issue 43, so by keeping them intact all along, I’m able to communicate this little joke. The same thing happens with the “Meet the Crew” pages, which are referenced in the text in a few points. A little joke I love throughout the series is the repeated homage to Kevin Maquire’s cover to Justice League of America 1. A neat thing about having comics bound yourself is that you can choose exactly what issues to include and what order to put them in. 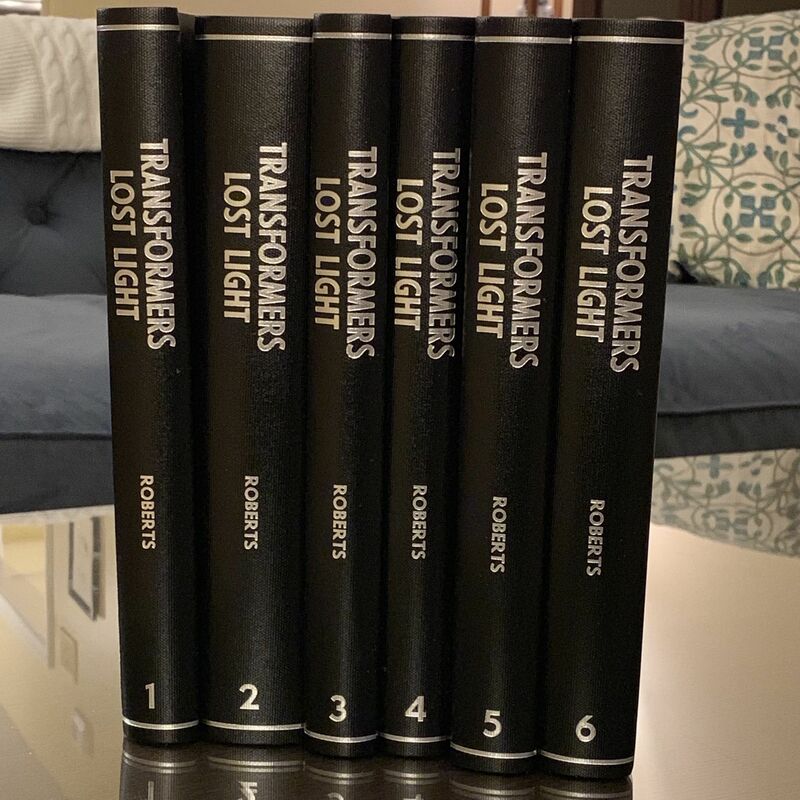 Until IDW does an omnibus, I think this is probably the most complete bound set of Roberts’s Transformers comics work there is. True or not, it has exactly the books I want, in the order I want to read them, with (I think) all the supplementary material that exists. Elsewhere I have a set of scripts that I got from Roberts at a convention along with Josh Burcham’s sketchbook. Someday I’ll get my hands on Milne and Lawrence’s. Transformers Spotlight: Megatron 15, “Everything In its Right Place.” I included this because it was written by Nick Roche and credits Roberts with a story assist. 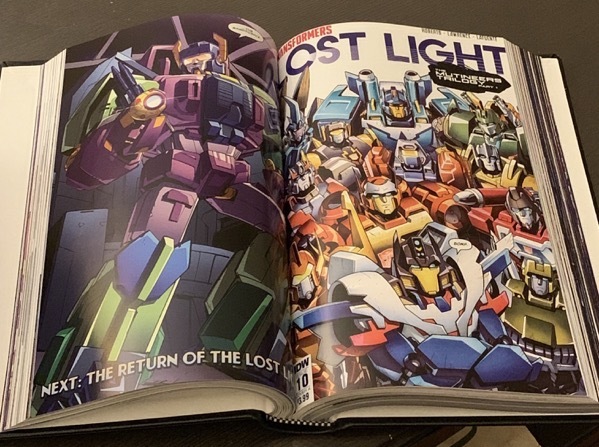 Transformers: Last Stand of the Wreckers 1-5, along with material from both the trade paperback and hardcover collections of the book, which each have original stories not present in the original issues. Yes, this means I bought the book three times. Tip: you can often get damaged copies on Amazon for real cheap. Since you’re taking a hairdryer to them, anyway, to melt off the glue and pull apart just a few pages, you don’t care if the cover is ripped. Transformers 22 and 23, “Chaos Theory,” which is the proper start to MTMtE. 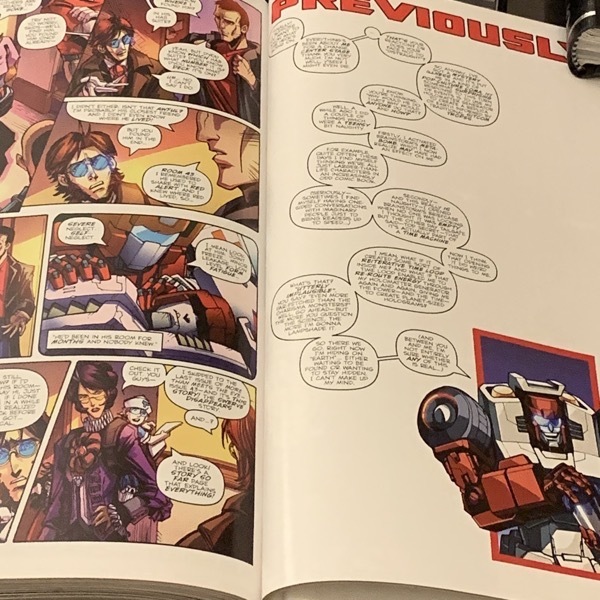 “Transformers: The Death of Optimus Prime.” The official IDW collection puts this in front of MTMtE volume 1, but I think it works better as a coda to the previous phase of IDW’s comics and lets MTMtE 1 stand on its own. Spotlight: Trailcutter and Hoist. These were published a year later but take place here. I generally try not to bring a book this far forward to make it fit, but there weren’t any major winks to interceding events so I think this move was safe. 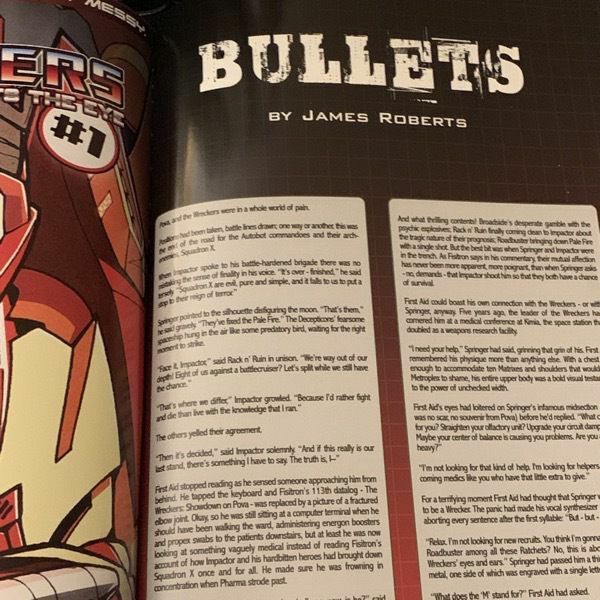 Material from the TPB of volume 1, which has some character sketches and other stuff. Dark Cybertron 1 and its deluxe edition, MTMtE and Robots in Disguise 23-27, alternating, and Dark Cybertron Finale. I generally try to keep a volume to around 20-25 issues – typically two years’ worth of stories. 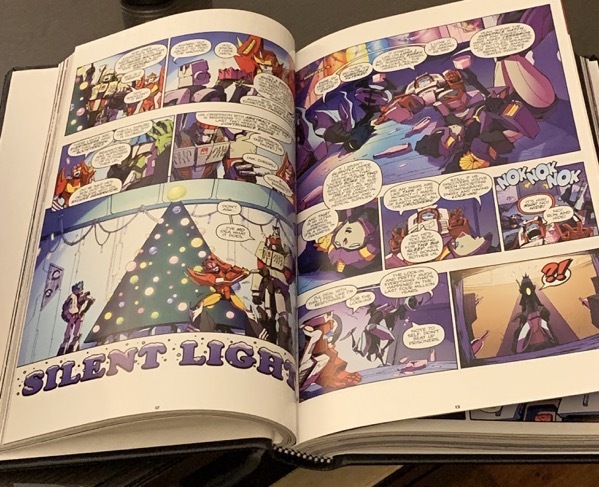 Any bigger and its gets unwieldy to read, though since IDW’s comics don’t have ads on story pages, they’re a bit slimmer. Still, I had to break up season two to keep it at a good size. The official trades break between 44 and 45, so I did the same. Much of season two’s arc is Megatron’s story and 44 ends with a good moment of reflection for him. Transformers: Titans Return one-shot, Transformers 56-57, MTMtE 56-57.